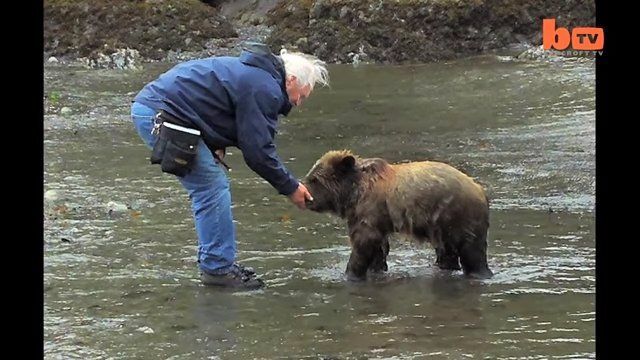 Watch Mark Dumas, an animal trainer that has been in the business for more than 40 years, swim and wrestle around with his 18-month-old pet grizzly, Billy. Billy loves to go for a swim, and he and Mark can be seen here splashing around in the pool having a great time. Billy is approximately 18 months old, weighs 250 pounds, and stands 5 feet tall. But to companion Dumas, he’s just like an overgrown child. 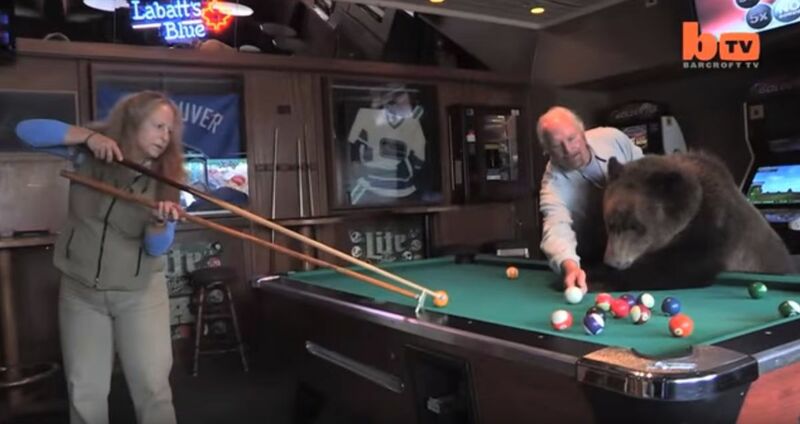 He loves following Dumas around to the grocery store, and even accompanies him to the pub, where they play pool and enjoy a brew. Billy has been with Dumas since he was a cub. Billy was originally born at a private zoo in Ontario, Canada, but trainer Dumas took him out for a day at the beach, and now the two are inseparable. Dumas and his wife Dawn have turned their home into a safe and friendly haven for Billy and regularly work with him to teach him tricks, such as standing on his hind legs while pretending to roar. Dumas acknowledges Billy is a quick learner and shows high intelligence and a good nature. Billy is often rewarded with his favorite treat of jam, which he loves eating straight from the jar. When fully grown, Billy will be an intimidating 800 pounds. While Billy has an excellent rapport with the Dumas family, Mark Dumas does not recommend that non-professionals try to handle bears, as an attack by these massive creatures often proves to be fatal. With his 40 years of experience, Dumas is able to understand the bear’s body language and recognize any signs of aggression. When this occurs, according to Dumas, he quickly backs off. Mark Dumas is one of the most in-demand animal trainers in Hollywood and has worked with a number of different animals. His movie credits include hits such as Fantastic Four: Rise of the Silver Surfer, Dreamcatcher, and Best in Show, Dumas tells Dogster in an interview about his work life. Take a look at the man and bear team together in the video below, and SHARE if you like it.